Finding the right home is like finding a third partner in your relation. You have to both love the location and all the logistics have to work out. We looked at some locations in the fall, but either there where some small deal breakers, or places that looked great on amateur photos, but where absolutely horrendous to visit, let alone living there. Work and life took over and in the middle of my month long stint covering the elections for national television I suddenly got a message from a befriended realtor. One visit later and we where in love. The next day pages where inked and the waiting period began until the current tenants would move out by August 1st. Problem was, we wanted to get in as soon as possible. So we had three months of preparation to make the move as simple as possible, with no real access to the apartment. 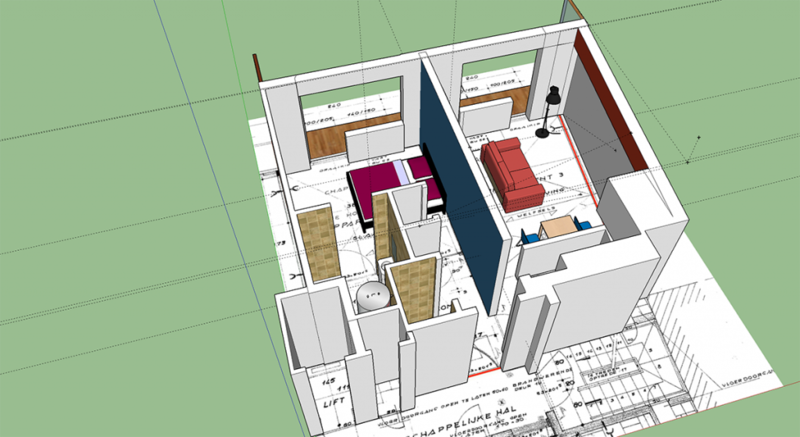 A piece of software that was indispensable was SketchUp. The 3D software made it very easy to make a virtual version of our home-to-be thanks to the original construction plans that we got our hands on. After one more visit back to take some measurements and pictures the game was on. A complete 3D version was created, so we had a full view on how everything would fit together. Early on we decided to start with an almost clean slate. Neither of us had any decent furniture, save for my bed. So the next step was easy: we stalked the site of IKEA and selected everything we liked and we felt would represent our interests and taste. After a day shopping in Brussels we decided to head down to the local IKEA branch. With Evernote loaded up, we checked what furniture would look good, and would fit in our place. We took pictures, notes and some measurements, and apart from the sitting comfort of our original sofa we stayed with the original list. Score! One mentionable moment: the BESTA crisis. The system is so broad in so many ways that making a choice can be very overwhelming. A small relationship crisis and a very helpful IKEA staff member later and everything was picked. While SketchUp is great for drawing walls, but once you start to place furniture in a room I quickly hit the limits of my 3D skills. Good thing I have about four crates of LEGO bricks in standby. Converting meters to a number of bricks I created scaled versions of the famed BESTA closets, the KALLAX shelves and even the NOCKEBY sofa. This way I had a tactile feeling of how everything will really work together. While the idea of using LEGO for something as big as architecture I will gladly direct you to the miniature LEGO bricks Modulex. Turns out the optimal location of all furniture is in the exact opposite of where all the connections for power and TV are. Then again, some extra cables will fix that problem! 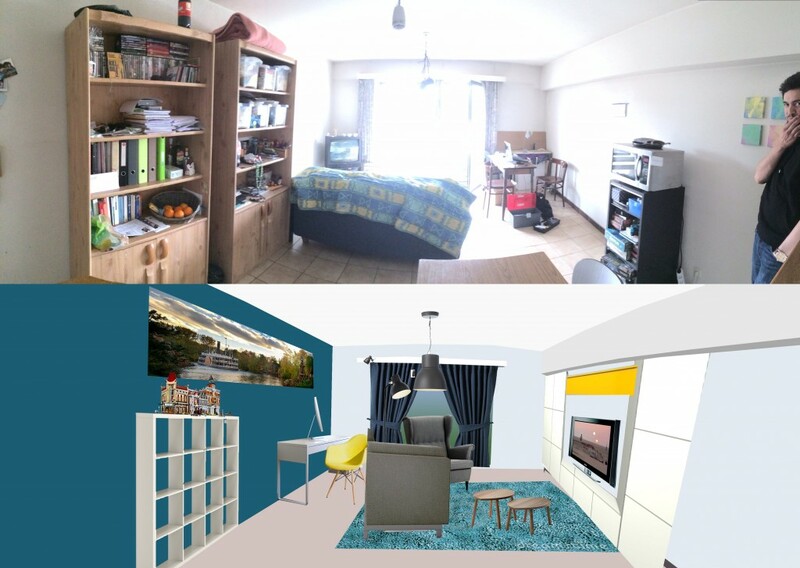 With the chosen items placed, I tried how it would really look with the right colours, so in the end I used a panorama I shot to create a virtual room where I could place all furniture and mess around with colours. Next step: IKEA again! 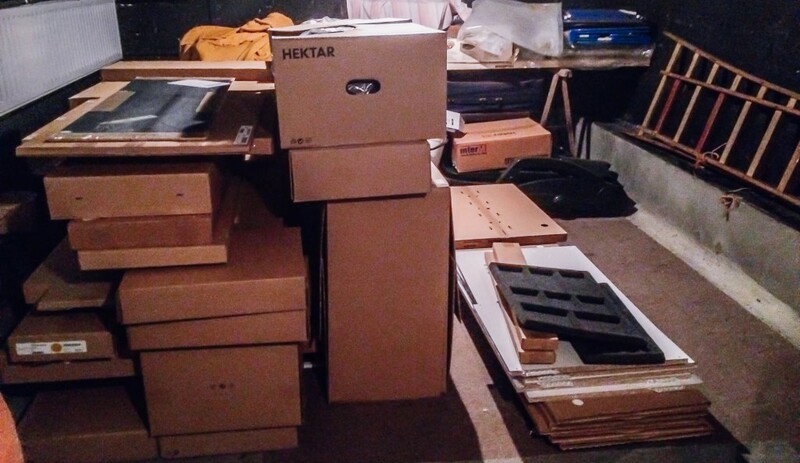 In four trips we collected around fifty boxes of IKEA construction fun. It’s almost like a huge real-live LEGO set. The one problem with IKEA is, even if you get a truck and have the place to load up your entire set of furniture at once, there will always be items out of stock. Not only that, you also have the logistics of moving a few carts of furniture at once, so unless you have a personal staff of movers following your every move in the store, multiple trips are in order. I’ve lived in the same place for my entire life, so my possessions are spread over one house, which is easy. But my fiancée has the problem of her stuff is at her dad, her mom, my place and in storage. Added problem: I don’t have the place to stock 50 IKEA boxes. Our battle plan was simple: we gather everything in my grandfather’s basement. It’s a clean and dry location, with enough place to collect everything that the movers will be able to easily pack their truck. Yep, the do-it-yourself guy has to get a moving company for the simple fact that the elevator at our new location is too small to actually move, and renting the moving equipment is just something where we don’t have the know-how. The move was high-paced, but never chaotic. With our big plans working out as it should, everything went like a breeze. Here’s a 4K time-lapse to show just how quick it went! In the past year a lot happened, including huge career advancements and a break-up. I’m not going to lie, it took a while until it really felt like ‘home’. When I had to refer to home, I still had the old place loaded up in my mind. But over time, this changed, just like my new home did. When you look at the video above, since then I added some more display shelves, extra lights and a fridge, moved the lounge chair and replaced my desk. With each step, it became closer to the place I hoped it would become. Some earlier bad compromises got replaced as well, and now I can finally say, I’m home. IKEA.com. For browsing, not those horrible 3D planners. Photoshop CC for making mock-ups on pictures.